Output Voltage – 14.6 Volts provides full & rapid recharge for lithium iron phosphate 12-Volt batteries. Reverse Battery Protection – Prevents charger damage if battery connections are accidently reversed. 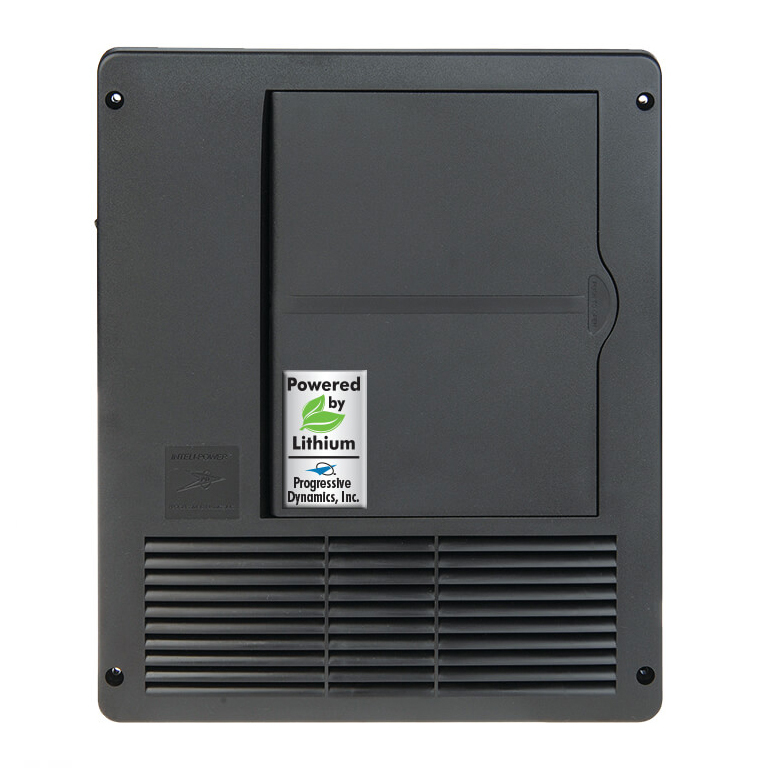 Provides Filtered DC Power – Ensures proper lithium Battery Management System (BMS) operation. Electronic Current Limiting – Automatically reduces output voltage to prevent overheating and possible damage if current limits are exceeded. High and Low Voltage Protection – Prevents charger damage from AC input voltage fluctuations. Automatic Thermal Protection – Reduces charger output to safe levels if unit temperature exceeds the pre-set temperature limits and protects charger damage due to excessive heat. Quiet Intelligent Cooling Fan – Only operates under high load conditions. 2-Year Limited Warranty – Progressive Dynamics Power Centers are designed tested, assembled and serviced in the U.S.A. Note: All models provide the Constant Current/Constant Voltage (CC/CV) charge profile as recommended by lithium battery manufacturers. 18, 12-Volt DC Fuse Holders 15 Rated For 20-Amps Max. and 4 Fuse Holders Rated For 30-Amps Max. LED indication of blown fuses and easily accessible battery disconnect switch connections. 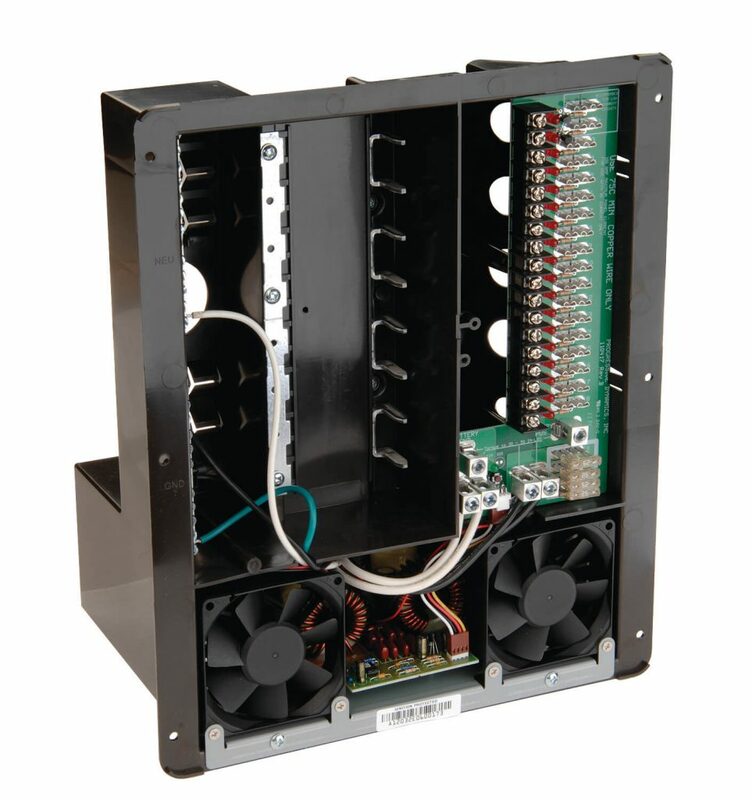 AC Distribution Panel Has Provisions For a Center Feed Dual 50-Amp Main and Twelve 120 VAC Branch Breakers. Note: 75-Amp and 90-Amp Converter Models are also available on special request.